who hasn't had the breaks he deserves..."
hugging their prejudices like feather boas..."
As I was learning to totter and dribble enthusiastically into a Farley's Rusk smeared bib in the early 1960s, British cinema (without me, alas) was undergoing something of a renaissance. Hollywood was about to enter the 60s with turgid 50s leftovers (its own renaissance some years away waiting to be liberated from Dennis Hopper's drug induced, hallucinogenic psyche). British cinema - real British cinema mind you, none of this BAFTA faux-British folding in of The Bourne Ultimatum nonsense – was about to briefly flare into gnashing, sparking and bonking working class life. Until the 60s, homegrown movies (with some exceptions, notably the oeuvre of Michael Powell and Emeric Pressburger) were clenched in class-defined mire. Film-making by its very nature was a middle class pursuit. There is a valid argument that this is still the case in the UK. Pulling free from the mud (to dive into very different mud on his own terms) was writer Alan Sillitoe who single-handedly created some of the defining works of what came to be known as the Free Cinema movement. Saturday Night and Sunday Morning originated as a Sillitoe novel and as a subsequently award winning film, it kick started a short-lived genre of movies that celebrated and even wallowed in the gritty, seemingly superficial and 'real'. 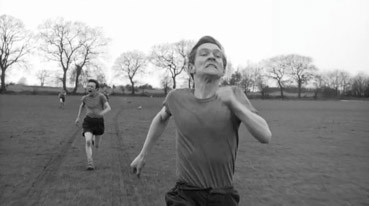 Sillitoe followed up with one of my most fondly remembered movies (I suspect in those days they were still called 'films' don't you know), Tony Richardson's The Loneliness of the Long Distance Runner. Richardson was feted, hailed and ostracized (all of which, I'm sure, gave him enormous pleasure) for the film, which drew enthusiastic support but also faint condemnation from certain quarters. Why on earth would any Englishman want to make a film about such reprobates? That was kind of the point. And he used a hand held camera! Outrage. What was he? French? In some respects (though perhaps not in the crucial ones), Loneliness was the Scum of its day, archly left wing, hypercritical and untrusting of authority. There were no billiard balls in socks but the comparison has to fall apart somewhere. Making a Tim Roth-like Made In Britain debut as a young hooligan was Tom Courtenay who went on to enjoy quite a blessed career. The only performance that nudges aside his sullen, angry turn as Colin in Lonelieness, is his dresser in, uh... The Dresser, in which he looked after an addled actor, Albert Finney. Seeing Finney blacking up thinking he was playing the moor on stage that night, Courtney wails, "Oh, not Othello, not Othello!" For some reason that line reading is hard wired into me. No idea why. Interesting to note that The Dresser featured Free Cinema's two principal actors (Finney from Saturday Night, Sunday Morning and Courtenay from Loneliness). The story is straightforward if the actual movie structural narrative is not. Colin Smith is a young, northern petty thief whose family lives in relative poverty and whose father is dying forgoing any medicine and pain relief. He's taken to borstal (for our non-UK readership, a prison for kids named after the village where the first one was established) and whilst there, he shows promise as a runner and is recruited to run a marathon. The reputation of the borstal in question would be seriously enhanced by any sporting prowess against a public school contingent, thus increasing the class divide. 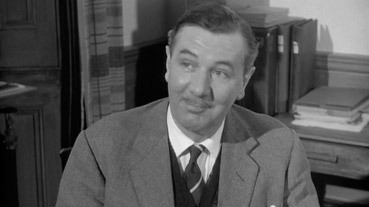 The Governor (played with middle class relish by Michael Redgrave) encourages Colin unaware that the boy has made a pact with himself along the lines of "Don't Let The Bastards Grind You Down". The delicious thrill of defiance is all the more sweet for the sweat that went into its application. Courtenay, despite his youth, is stuck in my head in perpetual middle age. He is impressive as Colin Smith revealing quite a range for an inexperienced actor. Richardson's loose filming technique, very unusual for the time, suited Courtenay's style and on the commentary the now veteran actor admits that it sometimes felt like they were shooting a documentary. His friend outside of borstal, in the carefree flashbacks of dirty weekends to Skegness, and nicking cars is Mike played by James Bolam. 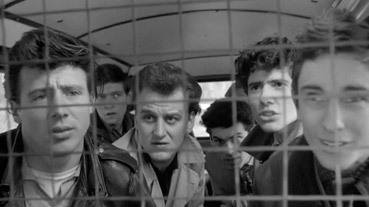 Always a staple northerner and no less talented for that, Bolam softens up Courtenay and the scenes with their girlfriends give the film a little more resonance rather than the unremitting borstal lock of repression and authoritarian control. One of the inmates is played by Inspector Morse himself, John Thaw who was Courtenay's room-mate in drama school. Spare your blushes but the good inspector's naked backside is on view for a full second – daring in 1962. Michael Redgrave plays the governor with some sympathy. Yes, he's the personification of order and control but when betrayed in the end by his marathon running protégé, it's hard not to feel a little for him. Nice to see Frank Finlay as a ticket seller in one brief scene. It's also the film debut of James Fox as the principal running threat from the public school boys. Ten years later, this fresh faced, fair haired lad originally destined to be a banker, makes an extraordinary movie (that we really should cover at some point) in which he plays a gangster. His performance and Performance are both truly unique. The musical score by John Addison is very rooted to its time – some free form brass jazz but mostly it's irony piled on irony of versions of the hymn Jerusalem. You know the one... "And did these feet in ancient time..." The one that gave a certain Oscar winning British film in 1982 its title – Chariots of Fire. Addison's constant reinvention of the hymn's restless and skewed orchestration is relentless and when we finally hear it sung by the boys in a sort of exhaled rage, the spirit of it still comes through. As film historian Robert Murphy reminds us, it's still William Blake's words. He could put a few words together, could our Billy. As the inmates sing, one of their number is recaptured and Richardson shoots this in such a way that passed the censors quivering scissors. But you still get the overwhelming intention of police brutality. Another assured craft on show in Loneliness is Antony Gibbs' film editing. Suiting and serving the performances and Richardson's directorial style, the editing saves up the best until last with a few glimpses of what was to come dropped along the way. From an editorial point of view, a truly startling cut is made in the interview between Courtenay and Alex McCowen (marvelous as Hitchcock's chief investigator in Frenzy) during the word association scene. Granted, today it wouldn't raise an eyebrow but there were rules that editors followed in the early sixties, things like "Never cut on a camera move," "Do not cut to a close up without a mid shot to soften the blow," etc. Nonsensical now but as ever, context is all important. As Brown the psychologist manages to prise the word 'dead' associated with 'father', he feels he's unlocked something from Colin's inner psyche. To indicate the significance of this, Gibbs gives us a ten frame flash cut of the tape recorder forcing us to almost subliminally 'record' this piece of information. Where Gibbs (and presumably Richardson) pull out all the editorial stops is the final montage during the end of the race – Colin Smith's character and motivations in cinematic montage. It's a fine piece of cinema lending weight to Colin's subsequent actions. Let's acknowledge the sound editing too – unusual for the sound of one scene to bleed so defiantly slowly over into the next scene. Loneliness is also full of lovely moments that reveal a sharp wit is at the helm. On a shopping spree, we are treated to ITV's starburst graphics that punctuated adverts in the 60s. Good God. I actually remember them. 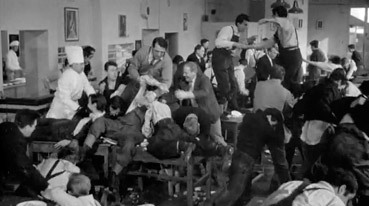 The concert at the borstal is truly awful (very deliberately) and so inappropriate that I half expected the boys to rush the stage. I get the satire but this really was pushing it. A bird whistler and a recital? Almost exactly 39 minutes in as the riot peaks, look out for the two dancing boys on the tables while all below are having several shades of excreta punched out of them. But the memory I'll be taking with me after viewing this first class DVD is the fact that writer Alan Sillitoe, recovering from an illness, was sent to live in Majorca. The title of the story just came to him (it's a lovely title which when spoken makes your tongue feel like it's had a gentle workout). He dived into reading books and the first book he mentions? L'Etranger (or 'The Outsider') by Albert Camus (the real McCoy). Excellent film, lovingly treated. Given the forty-seven years that have passed since Loneliness was released, it's scrubbed up very well. It's presented in 1.78:1 anamorphic and the contrast levels are good but from personal taste, I'd have preferred a little more richness in the blacks but the frequency range is very wide and the print and the restoration never belie the age of the work. Walter Lassally's terrific cinematography is well represented. There is noticeable grain on blank walls in the shopping sequence and the riot (fast film stock's greatest limitation) but this just says 'celluloid' so that's OK with me. There is a large drying mark on the most impressive shot of the movie (the wide angle horizon run which in one shot takes in both dying moon and rising sun) and it's a small mystery why that wasn't corrected. The mono, rendered in Dolby Digital is OK. I can't say great because I had a problem understanding some of the dialogue but then again, that could be my deficiencies not the fault of the recording. There are optional subtitles for the hearing impaired. Murphy is an informative source whose commentary is scene specific. He puts the political and historical context forward (the film was regarded as Communist polemic which from a 2009 perspective tells you all you need to know about the fear of the times). His delivery feels scripted but communication is communication and his is clear and rewarding. Interspersed is writer Alan Sillitoe who gives us a more unstructured but pleasing ramble about the movie's origins and snippets of information that are sometimes surprising and always well received. It may surprise you that Sillitoe was writing about the integrity of the writer. The borstal setting was relatively incidental. The third speaker is star, Tom Courtenay and his is the commentary that's more revealing because (as suspected) although Courtenay came from a working class background, he had absorbed the middle class 'utility belt' required at drama school. Courtenay is educated and regards himself as something of an aesthete. It's great fun listening to a man in his seventies (I presume the commentary was recorded fairly recently) commenting upon the callow youth in his first movie role (Courtenay was twenty-five at the time). There are chunks where all three commentators are silent and for some odd reason this greases the wheels of the overall presentation of the commentary (it helps if you love the movie). Deciding to become a Director Of Photography at fifteen, Lassally came to realize quickly that very few knew what they wanted to do with their lives. That's my first point of empathy established. I was as determined just as early. He takes us through his career with liberal clips from Loneliness and Momma Don't Allow, the short co-directed by Richardson and Karel Reisz. He has some enlightening things to say about hand held cinema ("...you shouldn't use it indiscriminately...") Someone tell the film-makers of today. A terrific companion piece for Loneliness but not in any way in the sense you might expect. Yes, it's two of the Free Cinema's prime movers directing together (Reisz and Richardson). It has that Lassally-shot look to it and is modern for its time. But it's more apt to be on this DVD to show you the horrific comparison between a movie that's been loved and restored and one that's been projected a thousand times. OK, there are six years between the films but Momma Don't Allow, a record of a jazz club in London and its working class clientele, is so scratched and beaten up, it's almost the bits of image you can discern that look like the foreign objects. Splices jump and flash (long before that became popular) but the feel for the people featured and the initial lazy jazz over ordinary people doing their ordinary jobs soon quickens to get the joint jumping. I'm old enough to recognize the half lyric that makes up the title... "Momma don't allow no guitars playing around here..." and that was before I Googled its source (Hank Thompson, a traditional number apparently). There is a narrative of sorts. A well-to-do couple arrives at the club in full swing and seems bemused by the almost ritual-like dance moves performed with a breezy ease by the dancers. At times these are quite mesmeric to watch. The slow dance follows, kisses are snatched and our well-to-do couple seems to be dancing to a very different tune. They leave and a short argument ends happily for one couple. By today's standards this is a tame affair but 2009 is to 1962 like a Mecano set is to a hula hoop. This kind of cinema in its day was a nun in a bikini, a banker without a bowler hat, a traveler without ear buds. So if you skew your perspective, you'll see how radical it was, man. Great fun for Free Cinema completists. As is usual and welcome from the BFI, there is the inlay booklet. It features an essay on the film and a biographical piece on Richardson, both by Philip Kemp. Added to these are a piece on writer Alan Sillitoe, information on the featured short and a note about Free Cinema. The nicest inclusion is the original ad for the Free Cinema movement – it's almost quaint. There is also some technical info about the transfer. I must make a topical but sad nod to Michael Redgrave's granddaughter, Natasha Richardson, daughter of Loneliness's director Tony, who died after a skiing accident a few days ago. Condolences to all affected by the tragedy. Loneliness is one of this writer's most significant films, one that said that even if it always meant bad news to go up against authority, it could be done with integrity and honesty. It was a delight to have my memories of this terrific movie enhanced by the DVD and not like so many other blue remembered reels that pale somewhat with age.